It is also inevitable that there will be a few quirks here and there, and so should you come across any bugs do let the team know. As always the chatroom is a user only feature so for the guests lurking, register! Channel: Here, you can select your channel. There is one main public room for now only. 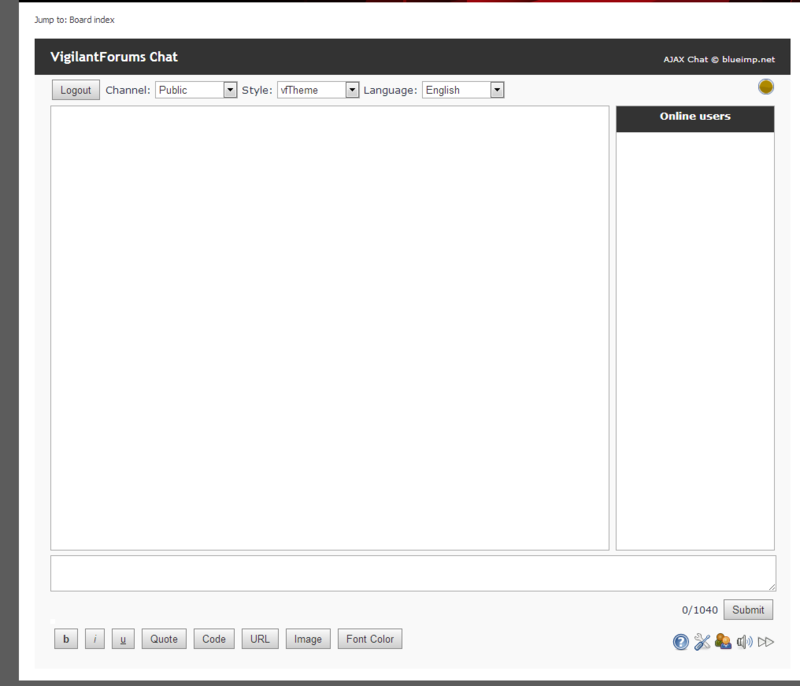 Public - The main channel, use this one for general chatting. Style: This sets the color scheme of the chat. The default is the vigilant forum theme which is the only one for now, though I may consider a contrast black theme for accessibility. /join CHANNEL - Joins a CHANNEL. You can only join the main channels, or a Private_[CHANNEL] that you've been invited to. /join - Joins your own Private_[CHANNEL] without having to type it out. /invite - Invites someone to join the channel you are in. Also allows someone to join your Private_[CHANNEL]. /uninvite - Only useful involving Private_[CHANNEL]s, removing someone from your channel or otherwise removing their ability to join. its not working for me right now either. everything is blank. Works fine for me, just checked now. Is the whole page blank? Hmm. Do you get the same at this link? yep, just in full screen. Hexa wrote: Works fine for me, just checked now. Is the whole page blank? Hexa wrote: Hmm. Do you get the same at this link? Ok I see it now as well in a new browser and clean cache.